NewsHounds recently posted an article (link) illustrating--once again--that Bill O'Reilly won't let ignorance get in the way of an opinion*. 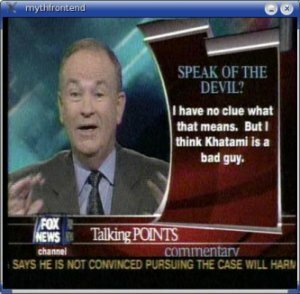 O'Reilly attacked the imaginary "liberal media" regarding an editorial (link) on former Iranian President Mohammad Khatami visiting the United States for a lecture tour. His argument: "I think Khatami is a bad guy." Having exhausted his facts, O'Reilly then digressed into his characteristic rants and rhetoric. *Note: While we at Monkey Fartz share that approach, we've never claimed to be a Moral Beacon and shaper of opinion.